MRSI has the potential to provide metabolic evidence of tumor activity that may be an important guide for therapeutic decisions. The treatment planning process and treatment planning systems should therefore have the ability to incorporate both metabolic and anatomic data in order to determine appropriate target volumes. Many problems need to be addressed and much work needs to be done in order to determine the optimal way to incorporate indices of metabolic activity, especially in light of newer treatment techniques such as IMRT; however, it is the present author’s belief that strong consideration should be given to the incorporation of functional imaging into the treatment process for focal or boost treatments for brain and prostate tumors. 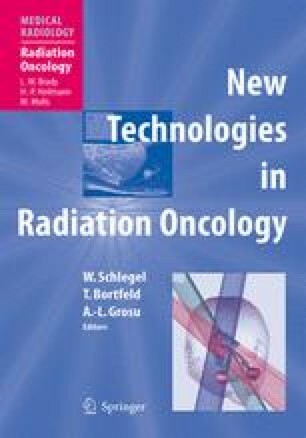 Given the discrepancies that have been found between MRI and MRSI determinants of target volumes, the results of controlled dose escalation studies for malignant tumors of the brain that have used MRI-derived target volumes should also be reevaluated given the possibility that these volumes may have been suboptimally defined.